What made this story so popular? Why does it stick with us so? Is it the idea of a young woman, not knowing who she is or where she belongs, making a name for herself in the world? Is it triumph over evil? Is it the music itself which seems to speak to the heart of who we all are - reminding us to take small moments to think about our favorite things? In a day and age where we do not have much time to think about what's for dinner, the reminder to think about the things we truly value and enjoy is definitely valid. 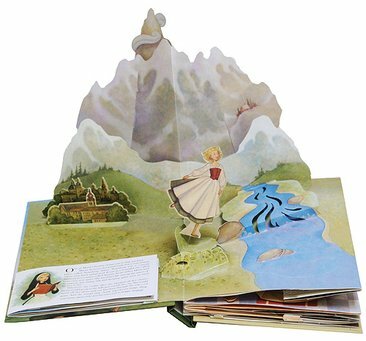 To mark the 50th anniversary of this Broadway musical, Simon &; Schuster have released a special Sound of Music: A Classic Collectible Pop-Up book . Every page spread depicts a now very familiar scene. It opens with Maria (literally) twirling away in the hills which she loved so much. A small book (with extra pop-up pictures inside of it) with pages to turn also appears on each spread so that you can read the book as a story (apart from oo-ing and aahh-ing over the pop up displays themselves, of course). This is a well-designed book that draws you in to scenes, such as Maria meeting the Von Trapp children for the first time or the wedding ceremony at the Nonnberg Abbey. As you read along with the story, you will also come across lyrics to some of the songs from the musical. "How do you solve a problem like Maria? A flibertijibit! A will-o'-the-wisp! A clown!" (I didn't even have to look at the words to type them up. I have the song memorized.) As do you, too, I am sure! The Von Trapp story is a remarkable one and well worth memorializing in song and on stage (and on the big screen). 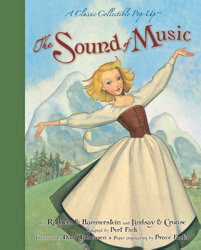 This Sound of Music Pop-up book is a fun way to remember their story and the Rogers and Hammerstein musical rendition. Although it is written for children, it's best enjoyed by older fingers guiding younger fingers through the scenes, stories and songs, to familiarize a new generation with a wonderful story that depicts fiery determination, honor, respect, human decency and brilliant talent. I love this story and I'm glad to have had the opportunity to enjoy this book and CD. Now some good news for one of you.... Simon & Schuster have generously offered one copy of the book and the CD to one reader here at Reading to Know! Merry Early Christmas from Simon & Schuster! WOW! This sounds wonderful. I'd love to win this. Double me! This looks so fun. My girls and just watched (some of it) and it was the first time for them to hear the songs. Ooh, I love The Sound of Music! That is one of my favorite movies of all time! We just watched this & were struck at how many more things jumped out at us now that we r older & have kids! This is one of my all time Favorites!!! Sign me up please! 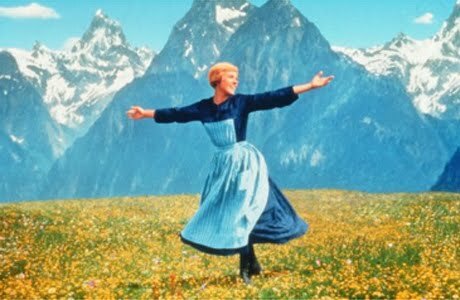 Julie Andrews is just amazing...ever time I hear one of her songs I wind up singing for the rest of the day! Thanks for the post! It is great!!! Love Sound of Music!!! Thanks for the opportunity and the post!!! I really enjoyed it! We watched the movie last year with my kids. Will liked the singing but was a little young to follow the whole story. Oh, my goodness. I have tears in my eyes. I LOVE THE SOUND OF MUSIC!!!!!!!!!!!!!!!!!!!!!!!!! Truly, it's one of my all time favorites!!! Please, please, please pick me!!! Of course i had these lyrics memorized! They were on my record player (along with Peter, Paul, and Mary!) in my room! Yup, i'd love to win! Thanks! My daughter loves the sound of music! We have a piano book of the songs and sit around the piano and sing. this would make a tremendous christmas present! I read your blog and comment regularly. Hopefully that works for a second entry! Wow - what a great giveaway. I LOVE the Sound of Music. The music is fantastic and sticks with you, but the story is also heart warming (although my husband once asked if Gone with the Wind was the story where they run away from the Nazis over the mountains . . . I think I need to force him to watch The Sound of Music and Gone With the Wind!). I have never heard anyone but Julie Andrews sing the songs before, it was fun to listen to. The pop-up books looks fantastic! I would love to win this giveaway, I have the movie on my wish list for Christmas; the book and CD would be a lovely addition. :) Thanks for the entry. Carrie, I'm not interested in winning anything. Just wanted to let you know that YOU WON the "Superior Scribblers" Award. See my blog for details. I love the Sound of Music. This looks great! I've had you in my Google Reader for months! The hiiiiillls are aliiiiiiiiiiive with the sound of muuuuuusic! Great giveaway! My whole family adores TSOM (it's even my husband's famous film)! I would love to share this book with my children! I would love to win this book for my nieces:) I am a huge fan of the movie !! ohh...I hope I win...pick me! I love The Sound of Music! Please enter me in your giveaway! And I subscribe by e-mail, so I hope that counts for entry #2. What a great gift. I'd love to have this. I love The Sound of Music. If i win, i'd sing the theme track for you .... now isn't that a fantastic incentive? 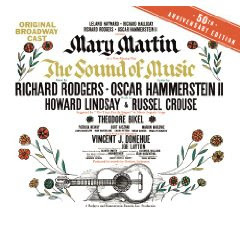 This musical is an old one as everyone knows and I have a granddaugter that would love the cd and book. Please enter me, into the drawing, Thanks and have a very Merry CHRISTMAS everyone. Oh, I love simple. Sounds like a lovely giveaway. Thanks. I'd love to win. I love The Sound of Music! This would be a wonderful family keepsake for my daughter. I'd love to win! Oh my goodness, my mom had that Mary Martin album and I had forgotten all about it until I saw it in this post! My sister and I loved playing her record albums on this giant stereo console we had. Our favorite, however, was the soundtrack album to American Graffiti.